Winston County population is 24,484. Its county seat is Double Springs. Known as Hancock County before 1858, the county is named in honor of John A. Winston, the fifteenth Governor of Alabama. During the American Civil War, Winston County gained attention for its opposition to secession, a sentiment so strong that the county is sometimes referred to as the Free State of Winston. The county today plays on its reputation as the “Free State of Winston” to attract tourists. The county’s opposition to the Confederacy is briefly mentioned in the novels To Kill a Mockingbird and Addie Pray. In 1883, the county seat was moved from Houston to Double Springs to be near the center of the county, since Cullman County was created from the eastern part of Winston County. Comprising 614 square miles, Winston County is located in the foothills of the Appalachian Mountains in northwest Alabama. It is part of the Cumberland Plateau physiographic section, and its terrain varies from low, rolling hills covered with evergreens to spectacular gorges, rock bluffs, and hardwood forests. Much of Winston County sits on the Warrior Coal Field, and the county’s soils are a mixture of plateau and coastal soils. The Black Warrior River and its tributaries flow throughout Winston County. Tributaries of both the Mulberry Fork and the Sipsey Fork flow through the county. Although the species diversity of the Mulberry Fork is relatively low compared with other water systems in the state, the Sipsey Fork is home to nearly 80 species of fish and is Alabama’s only National Wild and Scenic River System. 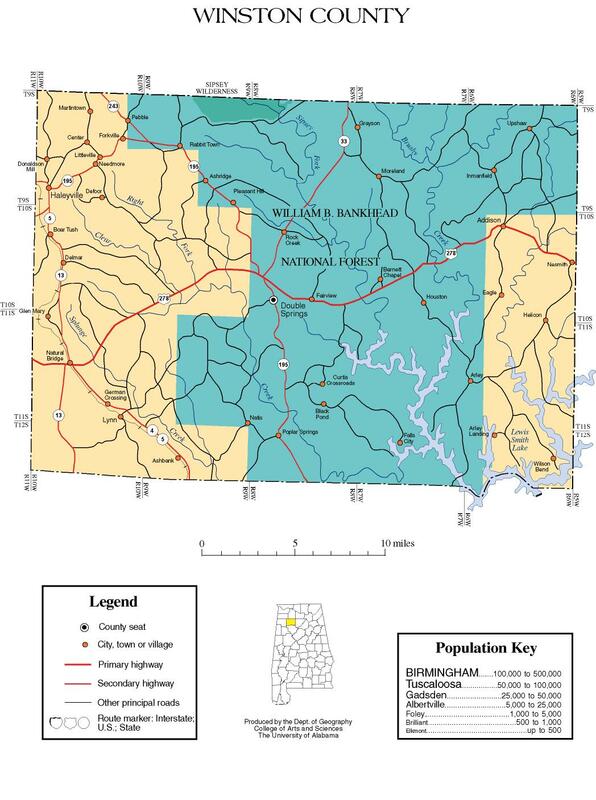 A large portion of Winston County is part of the William B. Bankhead National Forest, offering scenic views and outdoor recreational opportunities. Winston County’s main transportation route is U.S. Highway 278, which runs east-west through the middle of the county. The county has two airports: Double Springs-Winston County Airport and Posey Field, located in Kinlock Spring. The “Republic” of Winston, present-day Winston County, Alabama, was one of several places in the Confederate States of America where disaffection during the American Civil War was strong. In Winston County, this opposition became violent and had long-lasting political consequences—deep enough to generate a legend after the war that the county had seceded from Alabama. The first 911 call was made from Marion County Alabama in the city of Haleyville Alabama on February 16, 1968. A red rotary dial phone was used to make the call. The phone is housed in a plexiglass box in Haleyville city hall. The phone is on display during city hall business hours only so you might call to confirm. The area’s first inhabitants, the Cherokee Nation, lived in the area between Rocky Ravine and City Lake Park. They lived near the “division of the waters.” There is a continental divide in downtown Haleyville where water runs north to the Tennessee, south to the Warrior and west to the Tombigbee. When the Cherokee were forced out in 1836, many refused to go and and later intermarried. Nauvoo is a town in Walker and Winston counties. As of the 2010 census, the population of the town is 221, down from 284 in 2000. The town of Nauvoo began as a small agricultural community known as Blackwell’s Crossing. The construction of the Northern Alabama Railway through the area in 1888 led to increased exploitation of the area’s abundant coal and timber resources. Camp McDowell, the official camp and conference center of the Episcopal Diocese of Alabama, is located here. The lower falls of Caney Creek in the Bankhead National Forest, which covers nearly 200,000 acres in Lawrence, Franklin, and Winston counties. The forest was established in 1918 and renamed in honor of U.S. Representative William B. Bankhead in 1942. Double Springs rests inside the William B. Bankhead National Forest, and is near Lewis Smith Lake.